15 February/March 2018 unmanned systems inside mdLiDAR 1000 Features • Long fl ight time (even with a payload of 3.2 lbs.) • Low noise electrical motor • Applanix APX-15 single-board with survey-grade GNSS receiver and IMU • SICK 1 LiDAR • POSPac UAS direct georeferencing post-processing software • mdLiDAR processing software (point cloud processing and data export) team was able to fully map the 200-acre site in less than 50 minutes with the help of direct georeferencing. According to Microdrones, direct georeferencing is a highly efficient method for connecting aerial images to their geographic positioning on the Earth's surface. Key in the process is the integrated GNSS/IMU that measures the true 3D coordinates and orientation an- gles of the sensors, which allows for direct map produc- tion. Direct georeferencing has been shown to surpass the accuracy of others georeferencing methods such as traditional aerial triangulation, RTK, and PPK. RTK and PPK have inherent problems that reduce their accuracy, productivity and eff iciency. Many of these problems are revealed upon a detailed analysis of their associated mathematical and scientific principles and calculations. One of the major factors for the reduced accuracy of RTK and PPK is the calculation of orienta- tion angles of any sensor. Direct georeferencing mea- sures the orientation angles of the imaging sensor with high accuracy and high frequency at 200Hz or more (200 times per second) After completing the f lights and post processing the data, Stephenson was sold. He said, "It took us six hours to f ly, process and produce the topo and con- tour map. That's impressive. We really liked the fact that it is a turnkey fully integrated solution where the sensors, particularly the IMU/LiDAR, all talk to each other." 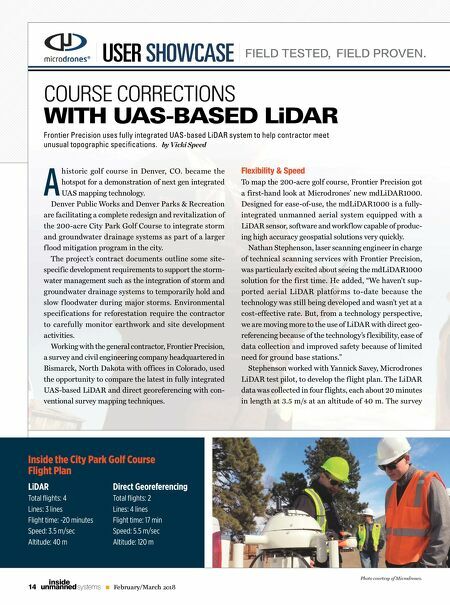 The Forest of Trees For the general contractor, one of the biggest advantages of the LiDAR-based solution on the golf course project was the visibility through vegetation. As part of the de- sign, the new course design incorporates a detailed refor- estation plan to preserve existing healthy stands of trees and maintain the park-like feel. Ultimately, the course will have a net gain of 500 trees. As part of the owner specifications, the contractor is not allowed to develop the site within 1.5x the canopy width of trees. As part of the mapping process, Frontier Precision used the LiDAR data to produce a topographic survey and contour map with an emphasis on tree widths. Stephenson says, "The greatest value for us from this proj- ect was how quickly this type of data can be collected. The contractor had performed a similar topographic survey of the site prior to construction, which took approximately two weeks and considerable labor and equipment costs. 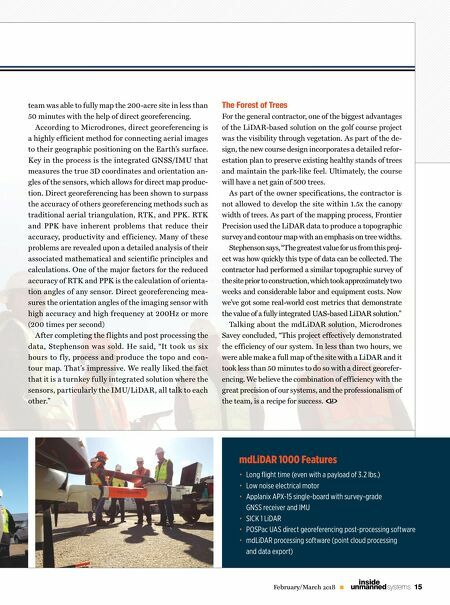 Now we've got some real-world cost metrics that demonstrate the value of a fully integrated UAS-based LiDAR solution." Talking about the mdLiDAR solution, Microdrones Savey concluded, "This project effectively demonstrated the efficiency of our system. In less than two hours, we were able make a full map of the site with a LiDAR and it took less than 50 minutes to do so with a direct georefer- encing. We believe the combination of efficiency with the great precision of our systems, and the professionalism of the team, is a recipe for success.